Worried that you might not be getting the needed amount of sleep that your body needs? Well, that could be a problem since getting enough sleep is just as important as the nutrients that you get from the food that you eat. It’s just that there are many factors that could greatly affect a person’s sleep. One of this is a phenomenon that sleep researchers usually refer to as “sleep inertia” – which is often associated to a state in which a person wakes up while still in the middle of his/her slow-wave (SWS) sleep cycle. 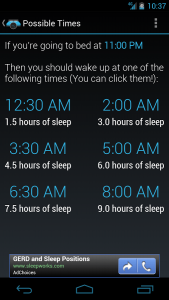 Speaking of which, this is the main reason why sleep cycle apps like 90night exists. 90night, also known as 90night: SleepyTime Calculator, is a simple sleep cycle calculator that you can use to calculate the total amount of time that you need to sleep. 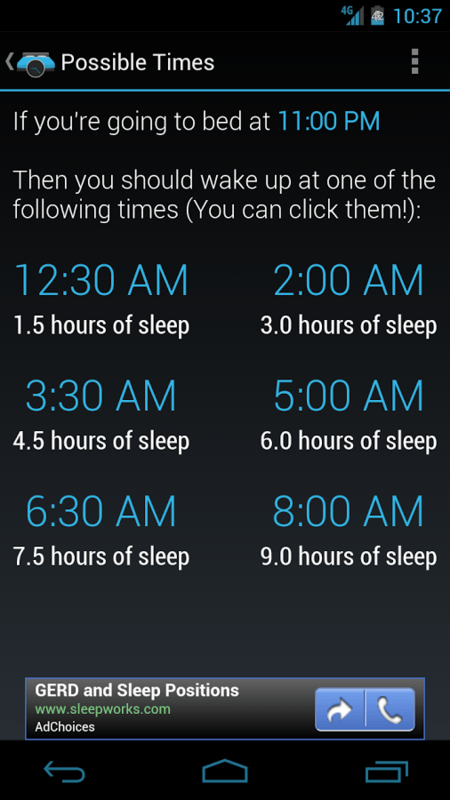 The main purpose of this app is to help you determine or calculate the ideal time for you sleep or wake up. By doing so, you can refrain yourself from waking up in the middle of your critical sleep cycles and thereby preventing you from feeling “groggy”. Moreover, 90night is easy to use. Just enter the time that you are going to bed or the time that you are going to wake up and then it will show you the best possible time/s for you to wake up or go to sleep. Like, for example if you happen to go to bed at 2:03AM then you need to wake up at 11:03AM to get your required amount of sleep. What’s also great about this app is that it can automatically set the alarm for your sleep or wake up time. Functionality wise, 90night definitely does a good job. It works accordingly and it would be very less likely for you to experience some bugs and glitches while using this app. In addition, this app mainly serves one purpose and that is to help you determine the time that you need to sleep as well as the time that you need to wake up. Why so? As I’ve already said above, waking up in the wrong sleep cycle stage will greatly affect your waking state. This means that you will not only feel groggy, your mental alertness will also decrease in such a way that you can’t even get your body to work at its best state. What I also like about this app is that it can set your alarm clock based on your chosen sleep time or wake time. 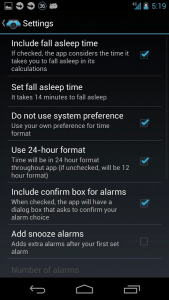 It also has a snooze feature which proves to be very handy for people who wish to extend their peaceful sleep time. 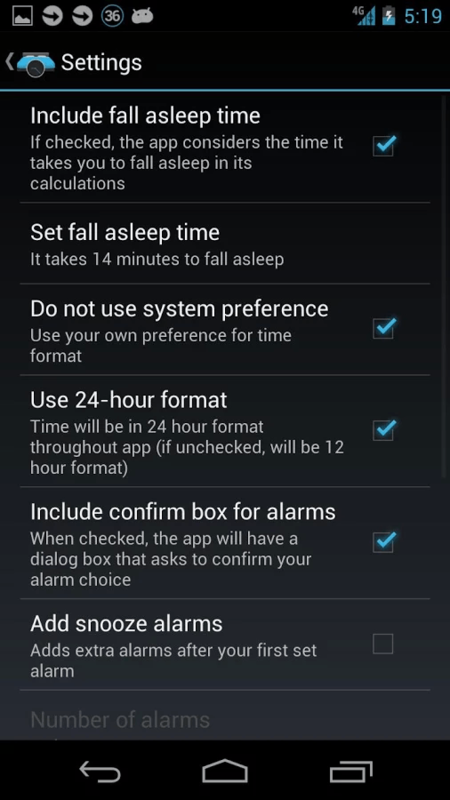 In addition, this app also supports both 12-hour and 24-hour time format. All in all, I can say that this app can be very useful especially for people who wish to improve their quality of sleep. Some may say that this app isn’t really effective but you will never know if it’s really good or not unless you try it. The effectiveness of 90night: SleepyTime Calculator may vary amongst its users but it definitely does a good job in what it’s intended to do. It also gives accurate results for the time that you need to sleep or wake up. Therefore, my best advice for you is to use this app at your own discretion.